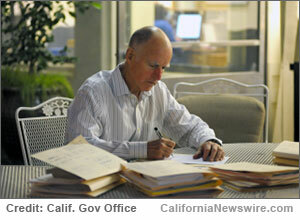 SACRAMENTO, Calif. /California Newswire/ — Yesterday, Calif. Governor Edmund G. Brown Jr. announced the following appointments: First, Paula Daniels, 59, of Los Angeles, has been appointed to the California Water Commission. Daniels is a Pritzker Environment and Sustainability Education Fellow for 2015. She has worked on issues related to food systems, water and climate as a volunteer at the Governor’s Office of Planning and Research since 2014 and has been a lecturer at the University of California, Los Angeles Institute of the Environment and Sustainability since 2010. Daniels was a senior advisor on food policy and special projects in water at the Los Angeles Mayor’s Office from 2011 to 2013 and was a commissioner at the City of Los Angeles Board of Public Works from 2005 to 2011. Daniels was an attorney in private practice from 2002 to 2005 and of counsel at Litt and Associates from 2001 to 2004. She was a partner at Kudo and Daniels LLP from 1996 to 2002 and at Kramer, Kramer and Daniels from 1993 to 1996. Daniels was a partner and associate at Berman and Clark from 1985 to 1993. She served as a member of the California Bay-Delta Authority from 2003 to 2010 and is a member of the California League of Conservation Voters Education Fund Board of Directors and the Heal the Bay Board of Governors. Daniels earned a Juris Doctor degree from Southwestern Law School. This position requires Senate confirmation and the compensation is $100 per diem. Daniels is a Democrat. Jose Del Bosque, Jr., 65, of Los Banos, has been reappointed to the California Water Commission, where he has served since 2010. Del Bosque has been a partner at J and G Contract Labor Inc. since 2005 and president of Empresas Del Bosque Inc. since 1985. He was manager at Three Star Farms from 1962 to 1984. Del Bosque is director-at-large at the California Melon Research Board, chairman emeritus at the AgSafe Board of Directors and a member of the Western Growers Association and the California Farm Bureau Federation. This position requires Senate confirmation and the compensation is $100 per diem. Del Bosque is registered without party preference. Maria Herrera, 32, of Visalia, has been appointed to the California Water Commission. Herrera has been a community development specialist at Self-Help Enterprises since 2014. She was a community advocacy director at the Community Water Center from 2008 to 2014 and an ag-aid inspector at the California Department of Food and Agriculture from 2004 to 2007. Herrera is a member of El Quinto Sol de America and la Asociación de Gente Unida por el Agua. This position requires Senate confirmation and the compensation is $100 per diem. Herrera is a Democrat. Silas Abrego, 70, of West Covina, has been appointed to the California State University Board of Trustees. Abrego served as acting vice president for student affairs at California State University, Fullerton from 2011 to 2012, where he was associate vice president for student affairs from 1998 to 2010 and director of students, academic services and university outreach from 1985 to 1998. He was coordinator at the Claremont Graduate University Tomas Rivera Policy Center’s California Education Policy Fellowship Program from 1981 to 1985 and assistant to the dean at the University of Southern California from 1982 to 1984, where he was director of the national education policy studies and research program from 1978 to 1982. Abrego is a member of the Association of Hispanics in Higher Education. He earned Doctor of Education and Master of Education degrees from the University of Southern California. This position requires Senate confirmation and the compensation is $100 per diem. Abrego is a Democrat. Peter Taylor, 56, of Los Angeles, has been appointed to the California State University Board of Trustees. Taylor has been president at the Educational Credit Management Corporation Foundation since 2014. He was served as chief financial officer at the University of California, Office of the President from 2009 to 2014 and was managing director of municipal finance at Barclays Capital and Lehman Brothers from 1993 to 2009. Taylor was finance director for the California Democratic Party from 1991 to 1992 and a regulatory and government affairs manager at General Telephone and Electronics Corporation, California from 1988 to 1991. He was executive director at the Coro Foundation, Southern California from 1987 to 1988 and served as legislative staff in the Office of California State Assembly Majority Leader Mike Roos from 1981 to 1987. Taylor is a member of the Edison International Board of Directors, J. Paul Getty Trust Board of Trustees and the Henry J. Kaiser Family Foundation Board of Trustees. He was chair of the James Irvine Foundation Board of Directors from 2010 to 2012 and of the University of California, Los Angeles African American Admissions Task Force from 2006 to 2008. Taylor earned a Master of Arts degree in public policy analysis from Claremont Graduate University. This position requires Senate confirmation and the compensation is $100 per diem. Taylor is a Democrat. Gary Reed, 68, of Porterville, has been appointed to the California Community Colleges Board of Governors, where he has served since 2005. Reed has been office manager at Reed and Reed Enterprises since 1980 and was a teacher at Newbury Park High School from 1970 to 1979. He has been a licensed registered representative since 1993. Reed earned a Master of Education degree in school management at the University of La Verne. This position requires Senate confirmation and the compensation is $100 per diem. Reed is a Republican. Valerie Lynne Shaw, 64, of Los Angeles, has been appointed to the California Community Colleges Board of Governors. Shaw was a commissioner at the Los Angeles City Board of Public Works from 1996 to 2013, where she was president from 2001 to 2005, and was an adjunct professor at the University of Southern California Department of Political Science from 2004 to 2011. She served as district director for Los Angeles City Council member Ruth Galanter from 1987 to 1993 and was a program manager at the Drew Economic Development Corporation from 1985 to 1987. Shaw served as public information officer for the Century Freeway Project from 1981 to 1985. She is a member of the 211 Los Angeles County Board of Directors, California Community Foundation’s Centinela Valley Medical and Community Funds, Wilfandel Club and the Los Angeles African American Women’s Public Political Institute. Shaw earned a Master of Public Administration degree from the University of Southern California. This position requires Senate confirmation and the compensation is $100 per diem. Shaw is a Democrat.